Wondering about a castle Located North of Frisco, Texas. on Hwy 1461? Do You know anything about this? The address is 5145 FM 1461 East - about two miles east of Hwy 289 in Prosper, TX (which is the town immediately north of Frisco). The outside structure is complete, but the inside is still unfinished. It is on 20 acres of land. 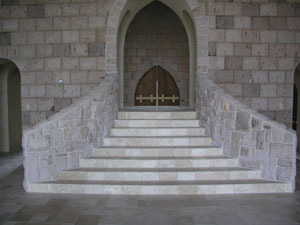 The castle was built in 1998 and has 9800 sq. ft of living area including the pool. It seems the previous owner had some financial troubles and the property is now owned by the American Bank of Texas in Sherman, TX. The bank is understandably motivated to find a buyer for this unique property. Interested parties can contact the bank's real estate department at 903-893-8191. It is appraised at $1,361,123 by the county appraisal district. The 'Unknown Castle' around the towns of Frisco/Prosper, TX, quite possibly could be the home that Deon Sanders is having built. It has been under construction for about 5 years. Prosper is my home town & I have taken a tour of the Castle and its beautiful! It was build for a famous hocky player's daughter, he wanted to live in a castle, but he and his wife split. The caste in Prosper is now $3.9 million. Thanks to Paul Jacobus and Matthew Haines for sending in the photos.